When we announced the new AdSense interface a few weeks ago, we mentioned how we've been working on building more functionality into the Ad Review Center to make it easier for you to find and manage your ads. 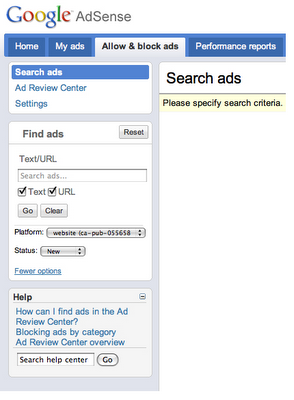 Today, we'd like to let you know that we're introducing the ability to search for ads in the Ad Review Center. This option is currently available to a limited number of publishers using the new AdSense interface, but we're working on rolling this out more widely as we invite more publishers to test the new interface. The search feature has been designed to improve your efficiency when finding ads to review. You'll be able to search for ads by keyword, display URL, or destination URL. For example, you can now search for all ads that have been placement targeted to your site with the destination URL of one of your competitors' websites. In addition, you can search across multiple AdSense products, like AdSense for mobile content and AdSense for feeds, and also specify whether you'd like to view allowed, blocked, or new ads. Although we aren't able to add more publishers to the test at this time, we wanted to give you a glimpse into one of the ways we're working to make the Ad Review Center easier to use. We'll be collecting feedback from the first group of publishers testing this feature, and plan to improve it and then expand to additional publishers in the coming months.